“Have You Noticed Your Energy is Cleaner?” is the subject line of an email I recently received from San Francisco Water Power Sewer, the public utility service that administers the city’s recently adopted CleanPowerSF service. Programs like these are known as Community Choice Aggregation, allowing cities and counties to partner with their investor-owned utility to deliver cleaner energy to residents and businesses. Thanks to you, San Francisco’s energy sources are getting cleaner. As one of the first CleanPowerSF customers, you began receiving cleaner energy at competitive rates starting with your May billing cycle. While you may not have noticed because you’re still getting the same service and monthly bill from PG&E, your carbon footprint has reduced! Yay, I like the sound of that. After a decade-long struggle to shake off fierce opposition to the public power program by what used to be our energy monopoly, aka PG&E, CleanPowerSF finally began serving its first customers about 3 months ago. In addition to the 7,400 customers (400 residential) who were auto-enrolled in the program, I am one of 633 customers who voluntarily signed up to join and receive energy with a 35 percent renewable energy mix, greater than the 29 percent offered by PG&E. This may not sound like a huge difference, but considering that CleanPowerSF’s rates are the same as PG&E’s but with an increased share of clean energy, it’s no surprise that the opt-out rate so far has been much lower than projected. In fact, according to Barbara Hale, assistant general manager of the SFPUC’s power enterprise, the opt-out rate so far has been 1.8 percent, a fraction of the 20 percent they had planned for. But it gets better! If you’re one of those folks who don’t mind spending a couple of extra bucks a month to invest in the future of life on Earth, there is the option of signing up for SuperGreen, CleanPowerSF’s 100% renewable energy option. For customers who wish to eliminate their electric greenhouse-gas emissions and contribute to local renewable energy infrastructure, CleanPowerSF offers SuperGreen – 100% California-certified renewable energy – for a slight premium over current PG&E rates. 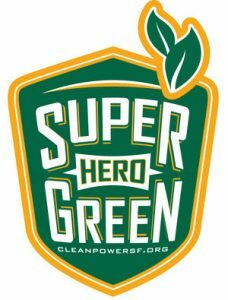 Because CleanPowerSF is not-for-profit, SuperGreen ratepayer funds will be reinvested locally in energy efficiency programs and new renewable energy facilities. Your choice will localize energy, create jobs and stabilize energy prices. So really, if you’re into reducing greenhouse gases, fighting climate change, and investing in local, renewable energy infrastructure that creates local jobs and stabilizes energy prices over time, going SuperGreen is a no-brainer. Personally, the idea of being able to cut my electricity carbon footprint to zero with such minimal effort and investment almost sounds too good to be true. Being called a “Clean Energy Super Hero” for it by your city is almost embarrassing, but if it helps getting more folks on board I’ll gladly take it. Become a Clean Energy Super Hero with SuperGreen! When it comes to improving our environment, it doesn’t take much to be a super hero. For just a few dollars more than our basic Green energy service, CleanPowerSF will when you choose SuperGreen – our 100% renewable energy option. If you haven’t already signed up, it’s never too late. SuperGreen energy 100% renewable and completely greenhouse gas-free. Your ratepayer funds will be reinvested locally in energy efficiency programs and new, renewable energy infrastructure. This is how we build a sustainable community. Become a SuperGreen Hero Today! Recruit a Friend for our Next Enrollment! The faster we grow participation in CleanPowerSF, the sooner our community can move toward energy independence and curb our impact on climate change. 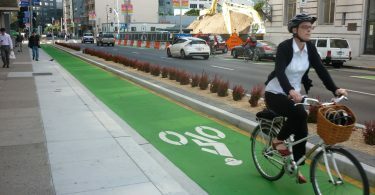 I think there’s still time to sign-up early to be included in the second enrollment this fall, so if you live in San Francisco or know people who do, please help spread the word about this unique opportunity to reduce greenhouse gas emissions with just a few clicks. For any such large-scale transformational endeavor to succeed, we need strength in numbers, so let’s get this Clean Power to the People! You may not physically notice that your energy just got cleaner, but if you’re like me, you’ll feel a few butterflies in your tummy.